Ah yes, another rainy morning. 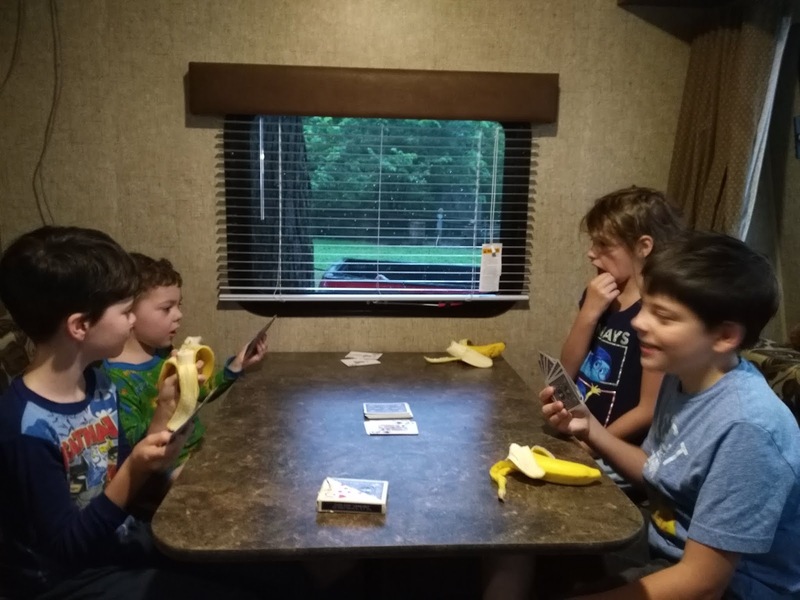 The kids started the day off gangbusters, with another epic battle of Crazy Eights. Even Jacob was figuring it out and finding his groove. 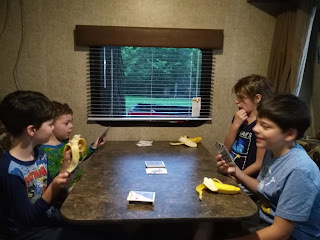 The kids ate breakfast and played cards, while we began packing up the food. No extensive cooked meals this morning. Then we kicked them out while we commenced tear down. They found a snake hole, and all kinds of critters in the mud. I honestly didn't mind their scientific investigations. I just wanted to clean out the camper with minimal interruption. As a reward, he got to be the person to retract the porch. Go ahead little brothers, jump in a mud puddle. I know it sounds like I'm swearing. But really, mud was Everywhere, there was no avoiding it. Even our Step was sinking into the mud. 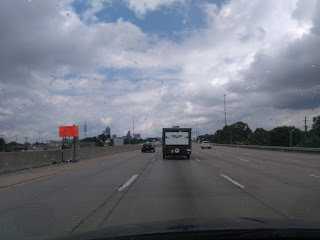 So we opted to leave Eric and Chris outside, running things into cars, while Mom and I stayed in and packed up, gathered clothing and bedding, and passed things out the door to our mudballs. Making holes in the mud. I tell you, these yahoos were cracking me up. When we did laundry, the next day I found the jaw of some animal hidden in the bedding. I know it wasn't my boys. Lisa has reported finding things before. But she didn't believe me. Meanwhile, my eldest channeled his inner Scout Badass. Yes, that's Chris getting the supports out from under the back of the camper, and helping to wind them up and put them away. My Mom didn't believe me that he's now stronger than me. Until she saw it. This kid is going to make an Awesome Camper as he ages. My Uncle Ron would've been so Proud. My husband is rather a Badass too. This was the moment I was proudest of him. He figured out how to dump the sewage so we could drive home. I had no idea how, nor was inclined to learn. He got it all figured out, and done. And we camped. With a potty. In three days of rain. There was a break in the clouds as we drove home, just long enough to get it into the backyard, and get our stuff out before the rain started again. I call our first camping trip with the Camper a Success!